American Turbine manufactures a kit that converts a Jacuzzi 12WJ pump to a much more efficient MIXED FLOW (high pressure) pump. The WJ ENERGIZER Kit will yield the same speed or better at a LOWER RPM. On average there is a 10 percent increase in performance with the Energizer Kit over the original 12WJ pump. 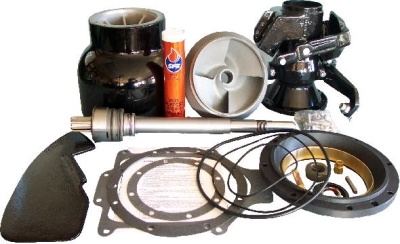 Parts for the Energizer Kit are much cheaper than original Jacuzzi 12WJ parts. There are many after market parts available for the Energizer Kit that are not produced for the original Jacuzzi.